According to Assassin's Creed producer SÃ©bastien Puel, Ubisoft has "had discussions" about a new game in the franchise set in the second World War - starring a female assassin. Speaking to Xbox World 360 about the upcoming Assassin's Creed II, Puel was asked about the possibility of having a female Assassin as the protagonist of a future AssCreed title. "We've had discussions on that very topic," responded Puel, "It could be really interesting but we'd need to find the right time period and place for that." "Where would that make sense? We don't want to just decide we want to change and have a female hero as the first inspiration is always the time period, but if you're talking about, say, World War II the economies in England and France were run by women because the men were off fighting. So maybe in this context you were a woman in England during WWII. Why not? Nothing prevents us from doing it." He does have a point, and it's possible that a hypothetical Assassin's Creed set in World War II would avoid the standard pitfalls of quote-unquote "World War II games." On the other hand, it feels like it could just end up becoming another Velvet Assassin style game. The refreshing part about the first two AssCreed games (for me, at least) was that they explored time periods that hadn't been covered in many other games - if any other games. The Crusades and the Renaissance are both relatively untrod ground, whereas WW2 has been trampled (goose-stepped, even) underfoot. There's so much potential here for interesting settings that aren't WW2. What about, say, Elizabethan England, the American and French Revolutions, or the Industrial Revolution - to name a few? How about the Civil War? It would be disappointing to fall back on something so run-of-the-mill, no? Still, Ubisoft appears aware of this very issue. 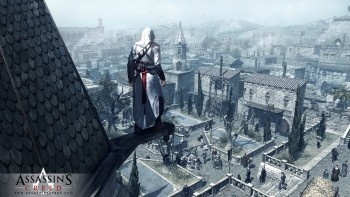 While Assassin's Creed had originally been envisioned as a trilogy, said creative director Patrice Fortier, the beauty of the premise meant that the world could be continually expanded and fleshed out. "What's so great about Assassin's Creed is that we can just expand and expand," said Fortier, "I'm often asked if we're doing a third game after ACII... I mean, we could do 35 of these."